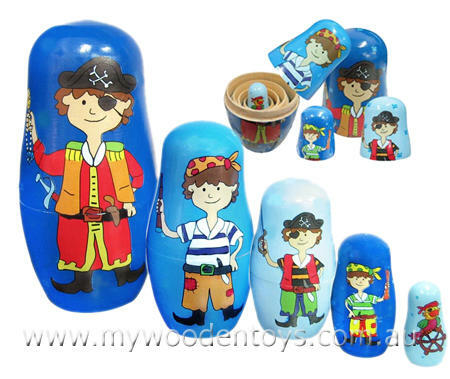 Pirate Russian Nesting Dolls are a great set of five nesting dolls with a swash buckling theme. Each doll has a different pirate image and as with all Russian nesting dolls they fit inside each other right down to the tiniest doll which has an eye-patched parrot on it. Russian dolls have entertained and fascinated for generations and now with a pirate theme what more can you ask! We like this because: "So much fun opening and finding another one and another one."